Nominations are invited for the Prestigious Katherine A. Kendall Memorial Award for distinguished contribution to the development of social work education internationally. The nominee can come from any region of the world and may or may not be a member of IASSW. The biography of the nominee must match the required criteria. The award will be presented to the recipient during the Joint World Conference on Social Work Education and Social Development in Rimini, Italy in July 2020. 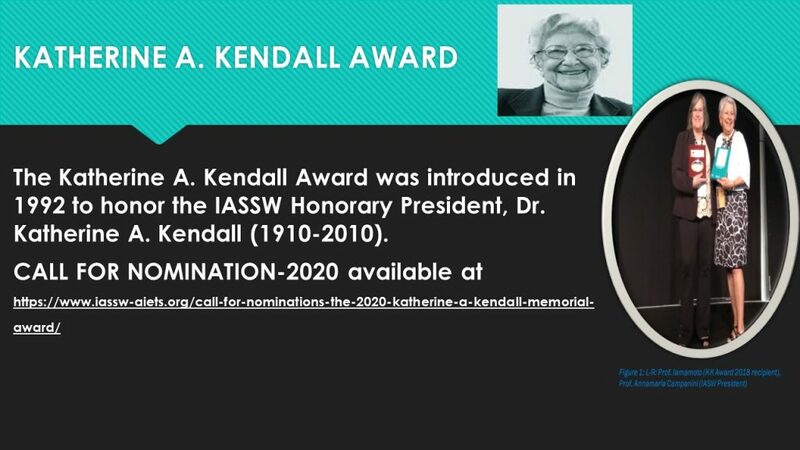 The Katherine A. Kendall Memorial Award was introduced in 1992 to honour the late IASSW Honorary President, Dr. Katherine A. Kendall. She served as voluntary secretary from 1954 to 1971 and Secretary-General of IASSW from 1971 to 1978. Dr. Kendall remained an active board member after her retirement and was active in the IASSW for more than five decades. Dr. Kendall played a significant role in promoting excellence in social work education and in the expansion of social work internationally. She provided strong leadership in the formation of regional organizations within IASSW, acknowledging the importance of indigenous curriculum development, and the diversity of local contexts. For more details please see http://www.socwork.net/sws/article/view/109/398. The intention of the award, which is made biennially, is to acknowledge significant contributions to the development of social work education at the international level. An international committee comprising of the Regional Vice-Presidents and a Chair of the Committee appointed by the IASSW President reviews nominees for the award and makes recommendations to the Board of Directors, which makes the final decision. A letter explaining how the candidate meets the criteria for the award. Involved in educational activities to promote equality and social justice in all societies. Researched and produced professional literature of interest and value to social work educators. Developed curricula that have advanced social work education worldwide. Involved in or supported innovative educational approaches leading to improvement of the quality of social services, approaches that are usable in different countries as models in teaching social work practice. Promoted social work education, nationally and regionally, and successful practice strategies from the fields of social welfare and social development. Involved in worldwide interpretation of professional education for social work as essential for preparation of well-qualified social work personnel.